When I was pregnant with my son B I had mango juice practically ever morning. Something about it soothed my stomach and comforted me. I like to think that it was B driving that flavor preference…but even if it wasn’t he had some very mango-flavored mornings during his gestation. 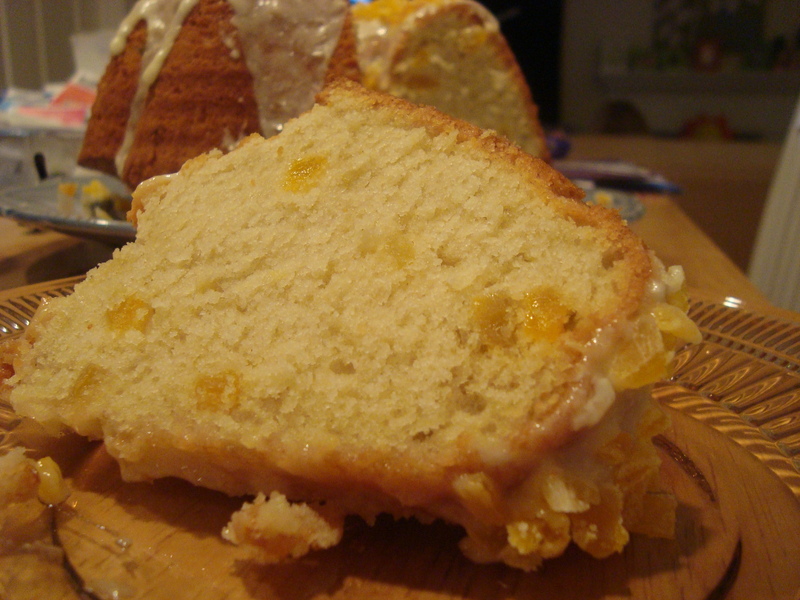 I decided to make this mango cake by taking a standard lemon/orange/lime pound cake recipe and swapping the citrus juice out for mango nectar. I also added some chopped dried mango for an additional touch of mango. The dried mango speckled throughout the cake turned out to be moist bites of mango…next time I will add more dried mango into the batter. The cake bakes for an hour and 30 minutes and then should cool completely (for an hour or two) before glazing it. 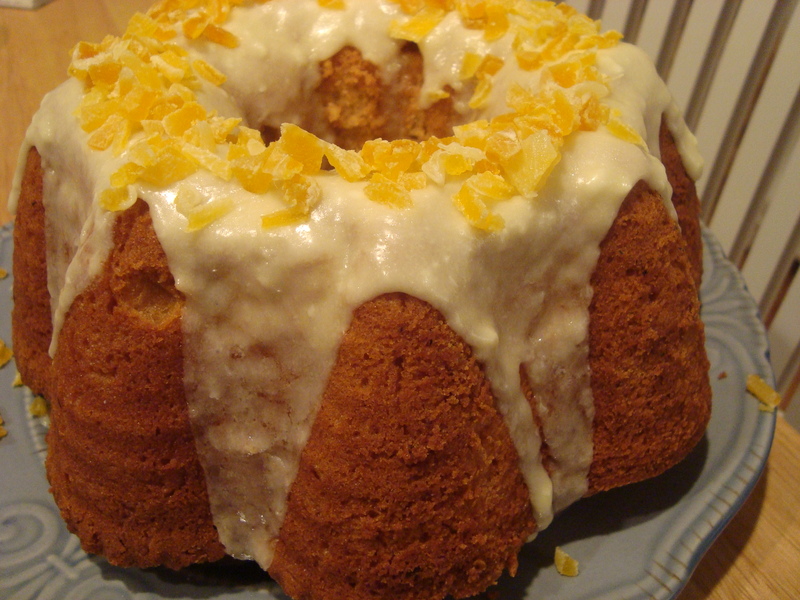 The cake is topped with a glaze containing mango nectar and sprinkled with more dried mango. 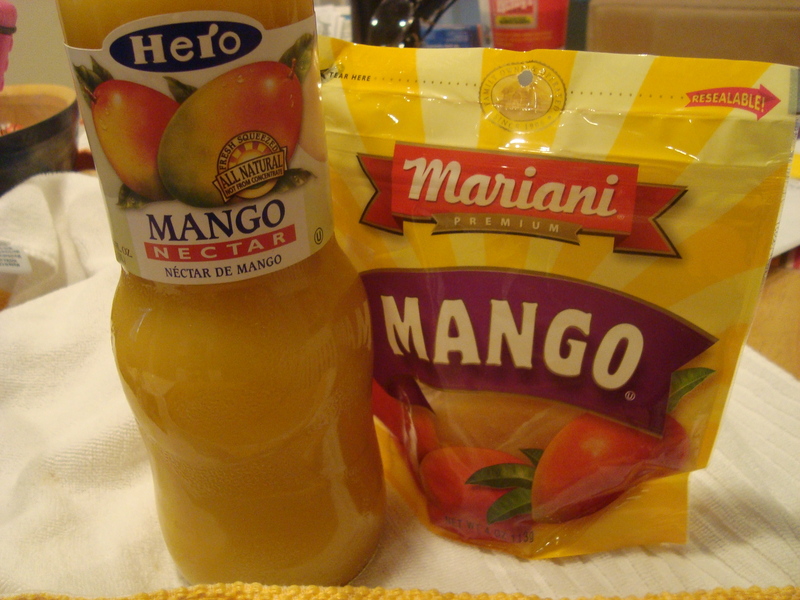 Resutling in…..mango perfection! Heat oven to 325 degrees F. Grease and flour a bundt cake pan. In medium bowl, mix flour, baking powder, and salt; set aside. In large bowl, beat granulated sugar, 1 1/4 cups butter, 1 teaspoon vanilla and the eggs with electric mixer on low speed for 30 seconds. Beat on high speed for 5 minutes, scraping bowl occasionally. On low speed, beat in flour mixture alternately with milk and 1/2 cup mango nectar. Set aside 2 tablespoons of the chopped mango for topping the cake. Stir the remaining chopped mango into the batter. Pour batter into prepared pan. Bake 1 hour 30 minutes or until a toothpick inserted in center comes out clean. Cool 20 minutes in pan. Remove cake from pan to cooling rack. Cool completely, about 2 hours. In small bowl, mix powdered sugar, 2 tablespoons butter, and 1/2 teaspoon vanilla. Using whisk, mix in mango nectar, 1 teaspoon at a time, until smooth and consistency of thick syrup. Drizzle glaze over top of cake; spread with spatula or back of spoon, letting some glaze drizzle down side of cake. Sprinkle reserved mangos on top of cake.